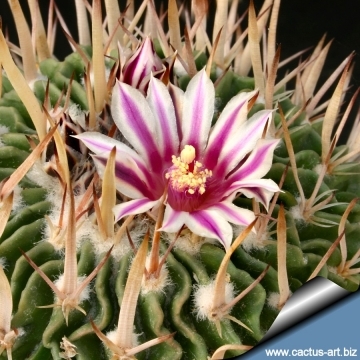 = Stenocactus xiphacanthus (Miq.) hort., nov. comb. ined. The specific name 'xiphacanthus' means sword shaped spines. Origin and Habitat: Cultivated plant of uncertain origin. 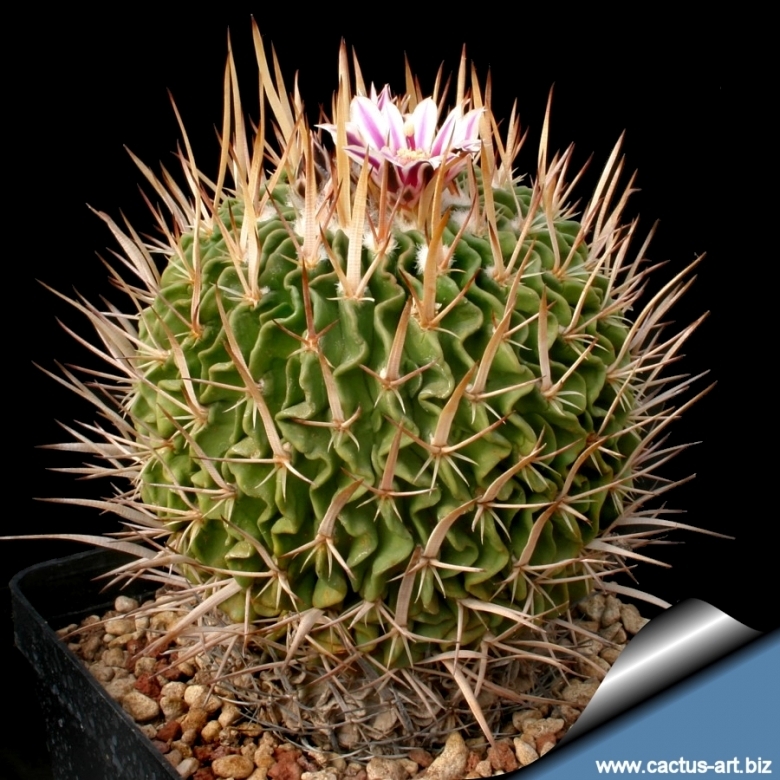 Description: "xiphacanthus" (= sword-shaped) is an unclear name applied to various Stenocactus in cultivation. This plants are characterized by flattened, sword-shaped ± broad, ferocious-looking spines with one long central spine directed upwards. Size:: It is usually a solitary plant , up to 20 cm tall, 10 cm wide. Ribs: Thin with very undulated or curled ridges. Remarks: This is one of the species with the prettiest spination. 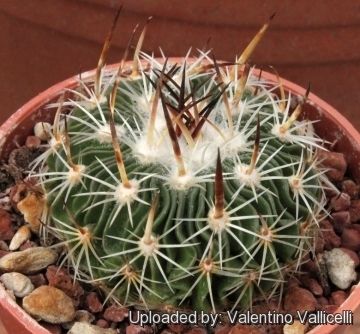 Notes: Stenocacti are commonly called wave or brain cacti because of their crinkly appearance. Because the undulating ribs on this small, spherical cactus are so numerous and so closely spaced that most of what you see is the wavy brain-like surface of the plant. 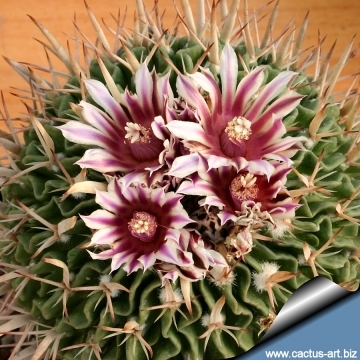 Cultivation and Propagation: Stenocactus xiphacanthus is easy to to care cactus, recommended for any collection that needs lots of light with ample airflow. Soils: It needs regular cacti soil with little organic matter (peat, humus). Watering: Water regularly in summer, but do not overwater (very wet-sensitively, especially in light of its succulent root system), allow to dry between watering. Its roots are easily lost in pots that stay damp for any length of time. It should not be watered at all in winter. In the rest period no high atmospheric humidity!! Care must be taken with watering as they tends to become swollen and untidy in growth habit if given too much water and shade. Propagation: Seeds (usually). Seeds germinate in 7-14 days at 21-27° C in spring, remove the glass cover gradually as the plants develops and keep ventilated, no full sun for young plants! The seedlings should not be disturbed until they are well rooted, after which they can be planted separately in small pots.